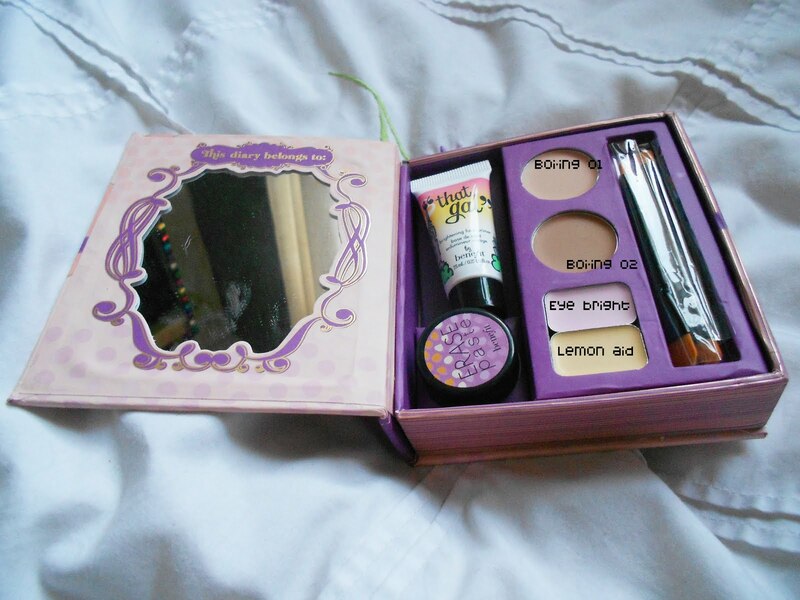 Sophie says..: Review: Benefit's 'Confessions of a Concealaholic' Concealer kit! Review: Benefit's 'Confessions of a Concealaholic' Concealer kit! Due to a hectic work schedule and deadlines etc. it's taken me about a month to review this kit that has been my make-up staple since the day I got it. It's Benefit's 'Confessions of a Concealaholic' - 'Your secret concealing & brightening kit'. When I first recieved it as a christmas present I thought it would be one of those makeup sets that you only whip out once or twice when you fancy experimenting, but I literally cannot get enough of this amazing selection of Benefit products. The kit also comes with two double ended brushes, with each end labelled with the product that it is used for, which makes application even easier. What I want to mention quickly is the packaging .. it looks like a storybook :) You open up the 'first page' and inside there is a mirror and instruction booklet, and comes with a sort of slip that goes over the top of the kit to stop it opening. This is really Benefit down to a tee - Beautifully packaged and as fun and inventive as the products themselves. 1. No make up. I am aware that this is a horrible picture of me. I am aware that I have lots of spots right now, it's just lovely! But I wanted to do this straight after I woke up when I usually have bags under my eyes and I thought it would be more effective as a concealer review to show how it conceals blemished skin. 2. "That Gal" Primer. The primer is the first part of the kit, as a primer is a perfect base for the rest of the kit (and all makeup to be honest! ), but it can also be worn alone. Accourding to Benefit: "Our silky pink primer takes your complexion from dull to darling! Simply smooth on for the look of brighter, smoother skin." 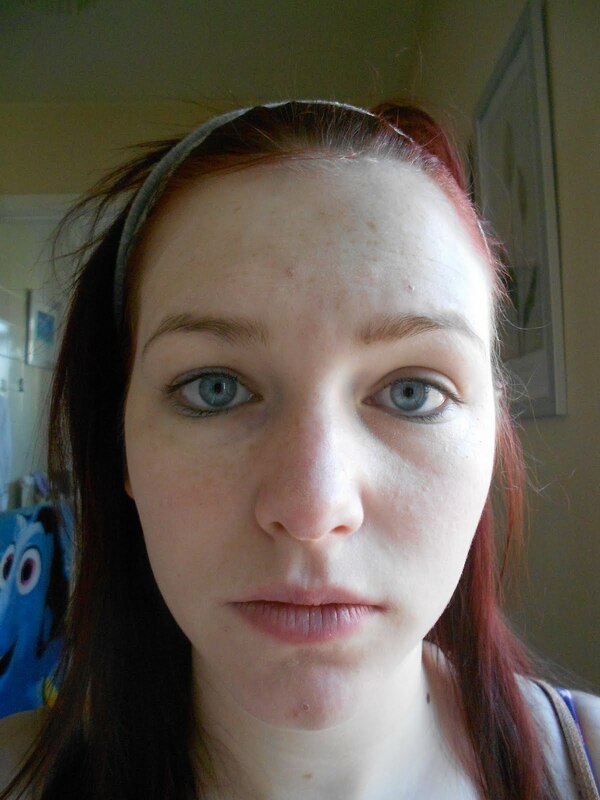 As you can see the silky pink primer has brightened my skin and toned down some of the redness on my nose and cheeks. It comes in a 7.5ml tube, which doesn't seem like much but a little really does go a long way. It's also perfect handbag size for touch up's throughout the day. I just use a pea-size amount on each cheek and around my t-zone, and then about half the size for my nose and chin, blending it into the skin in a outwards circular motion. 3. Erase Paste. The next stage in applying the concealer kit is the 'camoflage paste' for the eyes and face. I have used it on the right eye (In which I have also applied the next part of the kit as I forgot to photograph this part alone, oops!). As you can see, the purple bags underneath have been reduced and my eye actually looks wider. When applying the paste, it's really easy to just dunk the brush in and sweep it underneath the eye, but the paste is more liquid-like than the name suggests, so you really only need to use the tip of the brush, and then dot it underneath the eye. You then use your finger to blend the dots of paste, concealing your dark circles. 4. Lemon Aid. This works as the perfect base for eyeshadow, and really brightens your eyes. It's a bit strange because it appears yellow in this picture and is bright yellow before you blend it in, but it really does look natural and eliminates the fact that i've been up for about 10 minutes. The one problem with this particular product is that it's such a small amount (0.9 g) so I think it won't be long until I have to purchase the full-sized product. It is applied all over the lid and can also be applied up to the brow. Use the allocated brush and then blend with your fingertips. 5. Boi-ing. The next part of the kit i'll show you is the Boi-ing 'Industrial Strength' concealer. One of the greatest parts of the kit is that it has both 01 & o2, meaning you can blend the two and create your own unique concealer shade to match your skin tone. However, I am so pale that I don't need to blend the two so I use the lightest shade, 01. Using the allocated brush, it is dotted onto the blemished areas and patted in with your finger. It immediately reduces the redness, and with my powder on top I am assured that my spots are fully concealed. 6. Eye Bright. This is what I would recommend using at the end of the kit, and if anything the end of applying all of your makeup. Described as "A coffee break in a stick", the 0.9 g mini palette is the perfect brightener that is applied to the inner and outer corners of your eyes with the brush and blended. Tada! This is my finished make up for the day :) After the concealer kit had been applied, I finished off my makeup with some powder, eyeliner pencil and mascara. I can safely say that 'Confessions of a Concealaholic' makes it look like i've been up for hours, not minutes. I don't need to say much more, I believe the photographs speak for themselves. It retails at £28.50, which is such a bargain as the full-sized products are so much more expensive if bought separately. Click here to visit the Benefit website. Trust me, this is a make up kit you want to be using!